This is a very good, inexpensive tripod with a "fluid-effect" head. It does not offer the bells and whistles of a truly professional (read costly $500 to $5000 tripods and heads) but for under $150, the Magnus Video Tripod fits the bill for most videographers and video makers. Especially if you are a one man operation or are running & gunning. It is lightweight, quick to set up and easy to use. The "fluid-effect" head is smooth enough - especially when used with heavier camcorders and lens assemblies (up to 15.4 pounds). It provides a 50mm leveling ball along with a built in fluid level to make it easy to set up your camera on uneven ground. The 3 section legs are easy to use and lock. They stretch from the minimum 27 inches to about 5 feet high. It provides the basics - pan and tilt locks - but no drag adjustments. Its all or nothing. I found the drag to be pretty tight - which makes it easier to maintain smooth camera moves. The plate release works fine and enables you to get the camera off when you need to do some handheld work. With both right and left pan bar mounts, you can operate the tripod from either side. Height Range - 28.6" to 61"
A 50mm leveling ball with built-in spirit level works well for rapid, and accurate, setups. The 2-way fluid-effect head offers smooth motion and transport capabilities. The VT3000's three-sectioned legs break down to a very compact 30.0" (76.2cm) for easy transport. Passive counterbalance for stability, Separate pan and tilt locks, Left and right pan bar mounts, Mid-level spreader for stability on uneven surfaces, Anodized aluminum construction and provides convenient retractable rubber feet for protecting delicate floor surfaces. The Magnus VT-3000 Tripod System with Fluid Head is a stable, sturdy video tripod made from anodized aluminum that can support loads up to 6.6 lb. It provides many features commonly found on more expensive models. The two-way fluid head provides smooth operation, and features a half-ball mount with a diameter of 65mm, with left and right pan bar mounts. 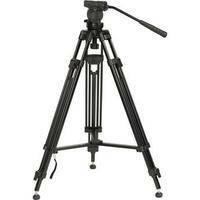 The VT-3000 tripod system weighs 7.75 lb. The 3-section leg design allows you to adjust the height of the tripod from 28.6" to 61". A mid-level spreader and passive counterbalance provide improved stability. The VT-3000 has separate pan and tilt locks and a bubble level for precision leveling, and offers a full 360&deg; pan range. The fixed counterbalance spring incorporated in the head provides smoother tilt movements. The included quick-release plate features a standard 1/4"-20 mounting screw with a video pin, and features a micro balance slider. Three-section leg design allows you to adjust the height of the tripod from 28.6" to 61"
Does your video make your viewers sea-sick? As basic as it may be to pros. Novice videographers tend to take the easy route and free hand everything. No matter how steady your hand, or how super duper your image stabilization feature. A good quality tripod is the anchor of a smooth video shoot. A tripod is not "training wheels" for your camcorder, but rather an essential extension of it. A good tripod is equally as important as your video light or external microphone. Video shot for the Internet will gain huge advantages when using a tripod. This is because all compression and encoding software uses "sampling" . Even if the human eye can't detect it, software can. The smoother the movement the better. This will result in a crisp and cleaner export to the video codec of your choice. Not only will it stream better and avoid buffer hang-ups. The file size will be smaller as less information needs to be saved. This is not a comparison or best tripod article. Instead I hope to enlighten you on what to look for and what not to buy. 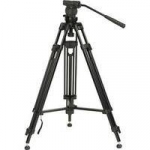 Following is a list of tripod manufactures so that you may shop and compare what will best serve your needs and budget. 1st - what not to buy. The $19.95 tripod sold by a major discount retailer is absolute junk. When the only thing important is low price - corners are cut in an effort to undercut any pricing competition. Since you will be replacing it in a few months and therefore spending at least another $19.95, just go ahead and spend at least $40.00 the first time. There is a huge difference in quality between a $20.00 tripod and a $40.00 one. For the video hobbyist, this may be all you need or want to invest. The rule here, as with most things in life, is you get what you pay for. From $40.00 to $100.00 you will find a wide variety of features and options. Here is what to look for and consider. Quick Release: Look for a head mount that has a quick release lever. Also a flip -out turner versus just a plain flat head screw that detaches your cam from the mounting plate. Bubble Level: Just because your tripods legs can be set exactly at the same height, does not mean the ground is level. This will help you avoid uneven horizons and crooked rooms. Feet: Avoid plastic cap feet found on cheap tripods. Rubber is much better, preferably with metal spikes. Especially on a light weight tripod. Plastic cap feet will slide all over tile floors. Leg locks: Quick release levers are more convenient than turn and tighten systems. None of your family or friends wants to wait for you to collapse your tri pod. Quick release levers - and a spreader are ideal. Unless you want to keep chasing after everyone on your next visit to the amusement park. Weight: Heavier is better because they are more stable. But light weight ones are easier to carry. Decide which is more important. I keep both an inexpensive lightweight tripod and a rock solid pro one. Height: Check to see how high and how low the tripod adjusts. Storage and portability need to be considered. Generally tripods go up in price as height increases. Personally, I like to shoot at a variety of heights for different effects. Try shooting the kids at 1/2 the average tripods height on their level. You will see the difference in perspective. Another trick is to grab the tripod at the bottom of the legs and hold it up over your head. This will give you about 12 feet instantly to shoot for example a crowd of people. Use the cams playback screen as your view finder. Mount: There are basically two types. Flat or bowl mount. Flat is all you will get under $100.00. But some pro tripods have a bowl mount which allows you to level the head without adjusting the legs. Head type: A true fluid head provides for incredibly smooth pans and tilts. This is a strong indicator of a quality tripod. Expect to pay over $75.00 to gain this feature. Be aware of the deceptive marketing used by some companies who use descriptions such as "fluid like" or "fluid action" on their packaging. This does not mean it is a true fluid head. TIP* If you find your non fluid head sticky, grease it with a dab of petroleum jelly. Other Considerations for the pros: Adaptability for tripod attachments such as auto zoom or pan remote controllers. Sony sells a nice line of these tripods equipped with these features at some savings over buying them separately. As do other companies. The price on remote control tripods have dropped considerably in the last 5 years. Can dolly legs / wheels be attached? While it is possible to spend as much as a $1,000.00 for a pro tripod. $300.00 is all 95% of pro videographers ever need to spend. Unless your situation demands a very specialized tripod above $300.00 --$400.00 you are either wasting your money or paying for features you will rarely use, or simply don't need. Occasionally I am asked what is the secret to good video. My standard answer is good equipment and experience. While experience only comes in time. Good equipment includes the best tripod your budget will afford, and you can get one today. My personal preference for budget priced light weight tripods is SILK. Then Bogen for a pro tripod. However, to be fair because my Bogen has endured many years of abuse and service, I have limited use of other manufactures products. Bogen is well deserving of their reputation for quality and I see more Bogen tripods in the field than any other pro tripod. I hope this article has helped to enlighten you on what to look for and the importance of a good tripod. If you do not have one and are ready to vastly improve your videos click on the B&H banner above and help support Internet Video Magazine with your purchase. They carry many brands at all price points. Just as a foot note, I have always had a pleasant buying experience whenever I have ordered through B&H. If you have the budget for the best - get a Gitzo. The Gitzo G1257LVL Leveling Mountaineer 6X Carbon Fiber Tripod uses advanced "Carbon 6X" carbon fiber material for its leg construction. This Leveling tripod has a ball joint-mounted center column designed to let you get your camera perfectly level simply by adjusting the column inclination instead of having to set each leg individually. Looking for a new way and better way to handhold your video camcorder? Check out the new "Fig Rig" from Manfrotto. Manfrotto worked alongside director Mike Figgis, whose films include Leaving Las Vegas and Cold Creek Manor, to develop a hand held DV camera support system that offers the shake-free stability of a tripod with the framing flexibility of handheld shooting. Respectively named for Figgis, the FIG RIG was the result of their collaborative efforts. Here is a list of most major tripod manufacturers.